Bridesmaids are one of those traditions we often don’t think about. We just accept that they’re apart of every wedding. The origin of the bridesmaid is interesting and not a little bizarre. Seeped in superstition, the bridesmaid tradition originated centuries ago. Bridesmaids would dress like the bride to confuse evil spirits and protect the bride. They would also literally serve the bride, helping her get ready, preparing “the nuptial bed,” showering the ceremony space with herbs meant to keep those aforementioned spirits at bay…you get the picture. We’ve come a long way from the spirit scaring days, and more and more modern brides are deciding to forgo the archaic tradition in favour of a more intimate and inclusive wedding day. 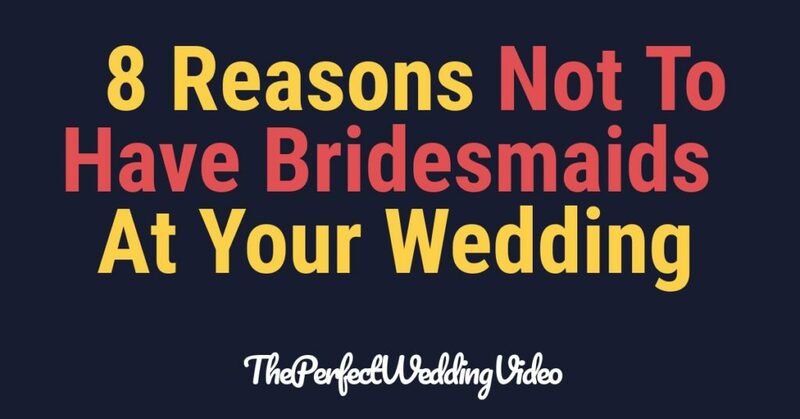 Below are eight reasons brides might consider not having bridesmaids at their wedding. Forgoing the tradition of having bridesmaids ensures that you and your soon-to-be spouse remain shining in the spotlight. You won’t have to worry about anyone’s dress but your own, about anyone’s duties but your own, and about anyone upstaging you, since all eyes will literally be on you and your significant other. Let’s be honest, we all want a little attention from time to time, and this isn’t called your special day for nothing! While it sounds nice to be surrounded by your favourite ladies before the big moment, there is something to be said for solitude. Getting ready with just a sister or a loved one or even by yourself can create a really nice, poignant memory as well as a peaceful environment to stave off those pre-wedding jitters. Instead of worrying about everyone else and how they’re getting ready, you can enjoy those last few moments as a miss in peace. There is so much time spent on group photos & videos that could be spent elsewhere. Instead of using that time for group photos that are staged and sometimes even a little stressful, you can take capture the moments with your new spouse and your family instead and then use that extra time to actually enjoy your special day! The videos we produce here at The Perfect Wedding Video we put quite a large focus on yourself and your significant other to capture the story of your wedding day as best as we can. Let’s face it, sometimes getting a group of your favourite friends together can lead to a little bit of drama. Who is going to be the maid of honour? Who gets to stand next to whom? What happens when one of the ladies doesn’t get along with another? Not having bridesmaids equals not having to deal with these silly questions on your wedding day. Not only does having bridesmaids mean you have to pick who among your friends will stand at the altar with you, it also means having to make a lot of decisions. From the bridesmaid’s dresses to the shoes to the hair styles to who will walk with whom and stand where, having bridesmaids on your wedding day results in a lot of stressful decisions. Deciding against bridesmaids just means more space in your mind to focus on the wedding and the reception! There are a lot of people up there at the altar when you decide to have a bridal party. By throwing out this tradition, you instantly create a more intimate flair by directing the spotlight to the special moment shared between you and your new life partner. No one feels left out, and instead, everyone feels like they have been invited to share in a very special moment in time. Bridesmaids come with a hefty price tag. By not having bridesmaids on your wedding day, you will save yourself as well as some of your closest friends’ a financial burden. Bridesmaids dresses cost a pretty penny, as do the matching shoes, hairstyling and makeup applications. Instead, you can use that money toward having fun at the reception! Being a bridesmaid can be really stressful, even with the best effort put in on your end. Instead, allow your best friends to simply be guests at your wedding and enjoy the fruits of your labour. Your girls will inevitably find their way to your side like they always do anyway, so instead of having a designated bridal party – let everyone party!